#hackfriday Holiday Make-A-Thon 2012 at Milwaukee Hackerspace « Adafruit Industries – Makers, hackers, artists, designers and engineers! The folks at Milwaukee Hackerspace are having a #hackfriday Holiday Make-A-Thon at Bucketworks today! It’s no secret that we love making, but did you also know we love helping others make things as well? It’s true… and one of the ways we like to help others is by taking part in the Holiday Make-A-Thon that happens at Bucketworks the day after Thanksgiving. Why bother putting up with the malls and the traffic and the crowds so you can try to get some great deal on the latest gadget that will be out of date in six months. You’d be much better off joining us at the Make-A-Thon where we’ll help you make something that will serve as a great gift this holiday season. We’ve got a few things planned, including ornaments you can decorate yourself (new designs for 2012!) You can also learn how to solder, and walk away with an awesome electronic blinky Milwaukee Makerspace logo. 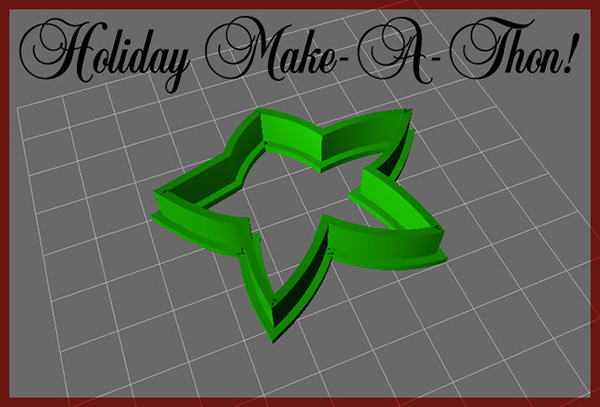 We’re also hoping to let people design their own cookie cutters that we will then 3D print for them. Exciting! Who doesn’t love whimsically shaped cookies!? This is a family-friendly event with lots of awesome people — if you’re in the area you should check it out! Hmm… That picture made my think of another use for a 3D printer: Making cookie cutters!